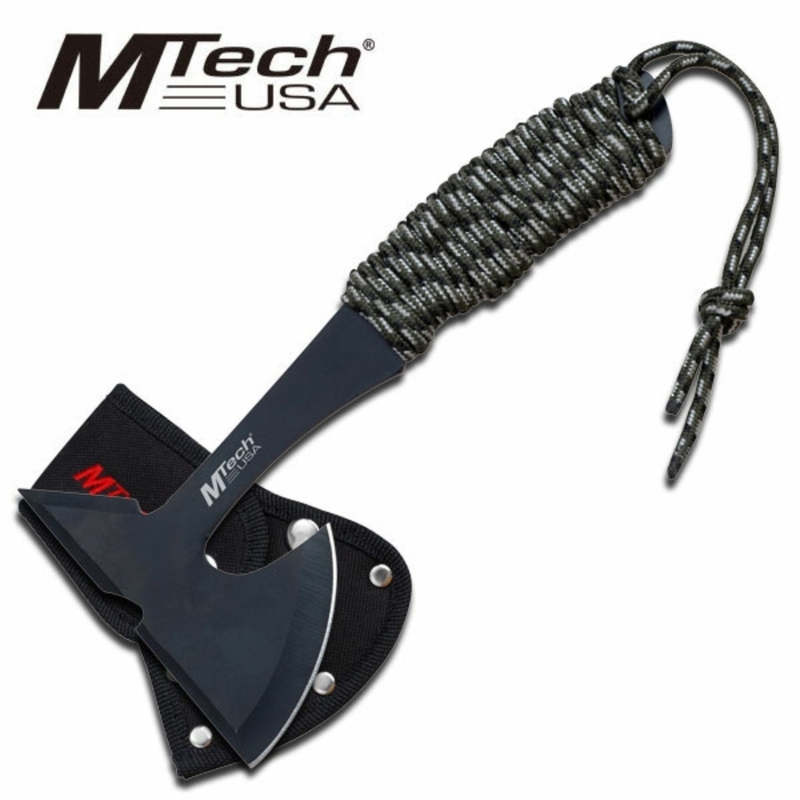 The Mtech USA "Campfire Elite" Axe is the perfect companion for your next outdoor adventures. Why do more people not carry axes with them on their outdoor adventures? Theare a number of reasons for this. One being that the majority iof axes on the market are big and bulky and not easily carried. Then the more compact axes are again heavy and bulky. Who wants to carry a a bulky axe all day in their pack? Then you have those that do this with a knife that just makes us cringe. There is always one person that wants to take thier fixed blade out, hold it an an angle to a small tree, and then find a thick branch to start beating on the knife to cut the tree down to start a fire. This can be done if no other option is exist, and should your knife survive the rugged abuse it just receives. You are going to spend valuable time shapening your knife that could be utilized elsewhere. This is why the Mtech USA "Campfire Elite" Axe is the perfect choice. This axe is lightweight and durable. The blade of the axe is 3MM thick stainless steel. The compact size also makes for an easier time sharpening the blade of the axe. The axe has a black finish and paracord wrapped handle. The paracord wrapped handle makes a great fire starting material, or could be used as lashing for a make shift shelter if needed in a survival situation.